The Womb Chair & Ottoman by Manhattan Home Design originally designed by Eero Saarinen continues to be one of the most recognized representations of mid-century modernism. This Saarinen-inspired womb lounge chair and ottoman set has both pieces attached with cushions for maximum comfort and support. Sitting down has never looked so stylish before. The womb chair is the bastion of neo-futuristic artwork, for which designer Eero Saarinen was well-established for. 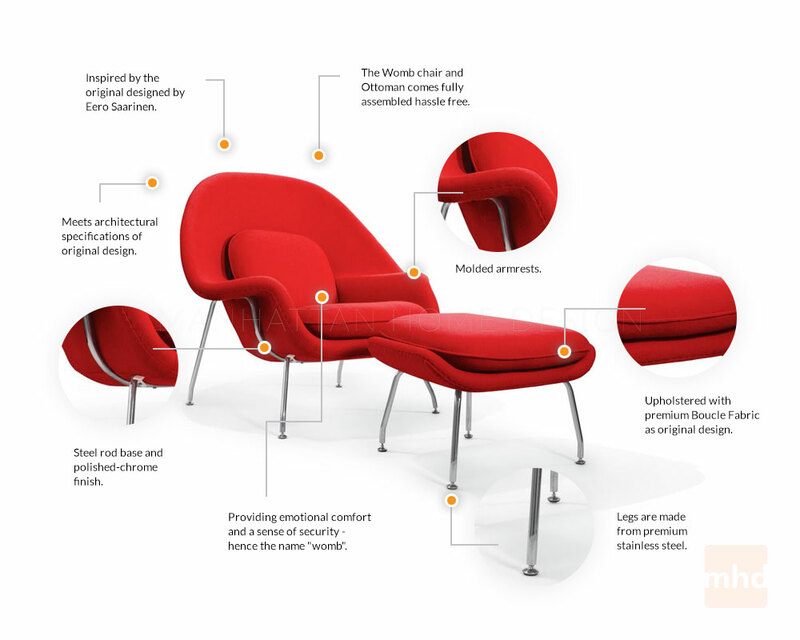 Additionally, the Saarinen Womb Chair and Ottoman provides unmatched comfort with molded foam over a fiberglass shell. The designer was able to create a piece that provides a relaxed sitting posture. Introduced in 1948, the Womb Chair and Ottoman is one of the most popular designs to come out of the 1940s. Saarinen realized that people sit in many different ways; he designed a chair that is comfortable whether lounging, slouching, or sitting with a leg thrown over the armrest. Paired with the Womb Ottoman, you may find yourself in the lap of luxury. Our high quality reproduction is crafted of a wool mixed fabric in a variety of colors. The Manhattan Home Design's Womb Chair is one of the most popular designs of the 1940s Stainless steel frame for both Manhattan Home Design's womb chair and ottoman Upholstered Fiberglass Shell Meets architectural specifications of the original design All pictures are taken of the actual product. Concerted efforts run deep in the expansively designed Manhattan Home Design's Womb Chair. First intended as a chair you can curl up in, it has since become a symbol for organic living. The natural motif portrays growth amidst silent resolve. Perhaps this is what makes the Womb both a reception and a lounge chair. Each of us would like to find our place as it were. Whether this means feeling welcomed in by the reception halls of businesses, or feeling welcome to relax into our own homes. While mid-century modernism showed us how to embark into the age of discovery, this finely upholstered classic taught us how to contemplate upon it. The shell of the Manhattan Home Design's Womb chair is made of molded fiberglass with foam padding. The legs are stainless steel and come with foot caps to prevent scratching on floors. Eero Saarinen was an eminent Finnish-American architect and industrial designer of the mid-20th century. His work paved the way for the neo-futuristic art movement. His projects are highly influential in the American architectural and furnishing landscapes, having designed the St. Louis Gateway Arch landmark, the TWK Flight Center at JFK International Airport and the womb chair. His personal style is defined by arches, curves and largeness. 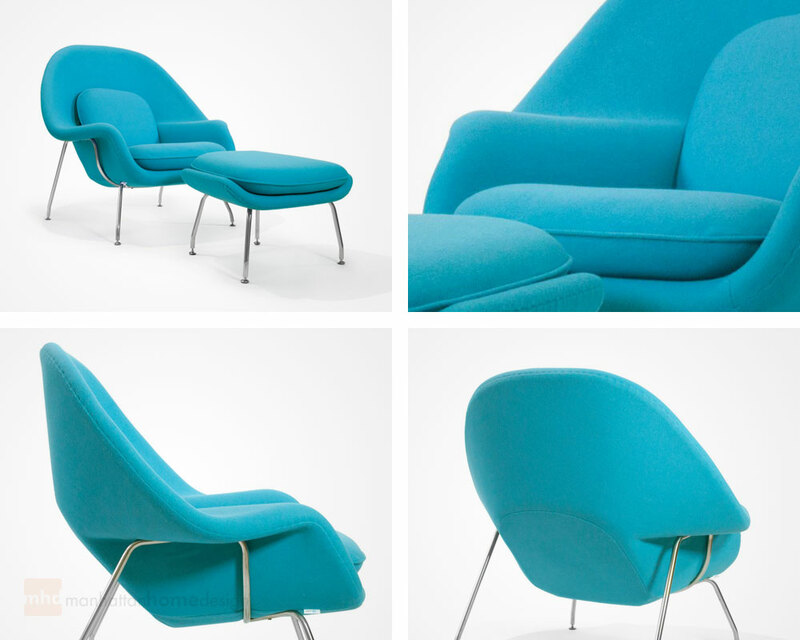 You can own a piece of his legacy with our Saarinen replica, the Womb Chair and Ottoman. Our Womb Chair reproduction is faithfully recreated with wool blend upholstery and stainless steel legs.This high quality Womb chair reproduction is manufactured to almost the exact same specification as the original. "I had a hard time picking a color, but decided on the dark gray. There are just so many options to choose from. It looked fantastic when I got it out of the box better than I imagined. And talk about comfort this chair is designed with comfort in mind. I never want to leave it. This is the best furniture purchase I have made in the last 20 years. Sitting in this chair is like getting a hug. It just makes you feel good. I love it and can't wait to sit in it. The chair was missing a floor "peg" I guess you could call it. I contacted MHD and they replaced the piece right away. Super friendly and helpful customer service. This chair is so close to the original I can't tell a difference. It is beautifully made with really high-quality materials. It is the most comfortable chair I ever sat in. I am so impressed that I will be looking for more furniture from MHD. Shipping and delivery were great with no problems. The chair is pretty and the red is vibrant. It is super comfortable and brightens up my room. It is perfect for curling up and reading a book. Delivery was fast, driver could have been more friendly, but he was on time.